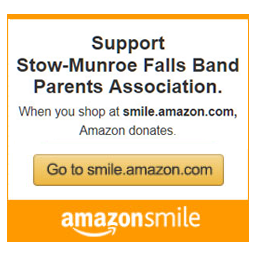 The Band Program is the largest organization at Stow-Munroe Falls High School. Over 250 students participate in our marching band, four concert bands, and three jazz bands. The SMFHS Bands perform over 25 times each year, including at football games, pep assemblies, band shows, parades, winter concerts, district and state level competitions, spring concerts. The band also performs for community events such as the Stow Fourth of July Parade, Memorial Day, honors/recognition ceremonies and graduation. The bands receive consistent superior ratings at District and State competitions as well as performance invitations to Bowl Games. 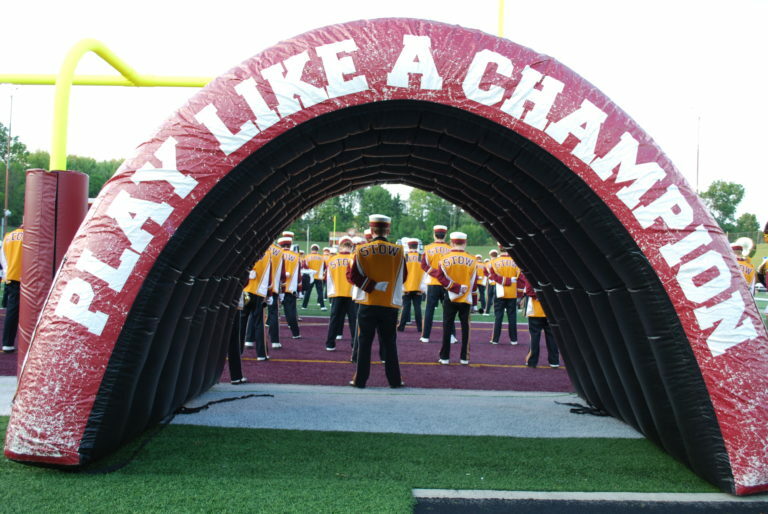 Stow-Munroe Falls High School is known statewide and nationally for the excellent band program it has developed. Students enrolling in band receive one credit for the class. As a result, students must participate in both marching band and concert band. Our marching band season begins in June with reading of the music for the next marching season. Students have the summer months to practice and have a strong introduction to the music. 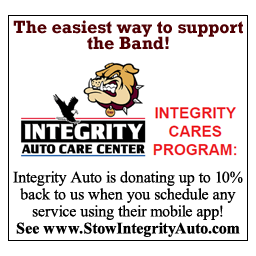 After the Stow Fourth of July Parade, the rest of July is band free. Early August or late July brings the return of the marching band. Students begin rehearsals during the first week of August, meeting daily from 6:00PM to 9:00PM. To assist new marchers during the first week back, we hold two freshman / new marcher rehearsals on Monday and Wednesday, from 10:00AM to noon. During these sessions students receive additional assistance in memorizing their music and marching techniques. The SMFHS Band Camp is held at Edinboro University in Edinboro, Pennsylvania, during the first or second week of August, from Sunday to Friday. There is a fee for band camp and students may participate in fundraisers to help defray the costs. All students must attend. Once school begins, the marching band rehearses daily during the school day as well as Thursday evenings from 6:00-9:00. The Freshman Concert Band students will be placed on the same audition upperclassmen band perform and are placed in chairs based on their score. This ensemble may participate in OMEA Adjudicated Events in class B or C.
The Gold and Maroon Symphonic Bands are designed as a mid to upper level high school performing ensembles. The class size is between 60-80 students. These ensembles compete in OMEA Adjudicated Events in class A or B. The intention through the audition, is both Gold and Maroon bands will be equal in performing level. With that in mind, both bands will be balanced with the same instrumentation. The Wind Ensemble is the highest level performing ensemble at SMFHS. Students perform musical selections usually reserved advanced high school and college level ensembles. This ensemble is considered the honors level class of the band department with 55-70 students. The Wind Ensemble competes in OMEA Adjudicated Events in class AA and was selected to perform at the OMEA State Professional Convention in 2000, The Ohio American School Band Directors Association Ohio Convention in 2005 and the Ohio Band Director’s Conference Hall Of Fame in 2008. The Wind Ensemble has also been asked to perform with bands from Kent State University and the University of Akron. Students who are unsatisfied with their placements at auditions or anytime throughout the year, are permitted and encouraged to challenge within their band or into a higher level band. The high school band is a strong supporter of the OMEA Solo and Ensemble Adjudicated Events. Each year more than 60 ensembles and soloists participate in this event. After marching band season, the band program offers a Jazz Ensemble Program. By audition, students are placed in Jazz Ensemble 1, Jazz Ensemble 2 or Jazz Lab Ensemble. Both Jazz Ensemble 1 and 2 are standard size ensembles, Jazz Lab is a double size ensemble allowing maximum involvement for our students to this American art form. The jazz ensembles typically rehearse on Wednesday or Thursday evenings.